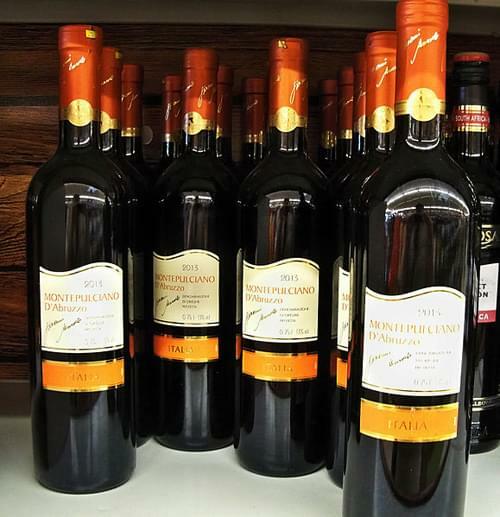 Abruzzo produces just one DOCG and three DOC wines that, though they carry brand names, used to be little known abroad and misjudged as cheap, generic, supermarket varieties. This is changing though, as of much of southern Italy the region is undergoing a gradual transition from bulk-wine production to bottled, boutique wines. In other words, a transition from a strictly industrial wine culture to one in which a limited and cared-for production that can bring commercial success and prosperity to the local residents. Though the situation is changing, there still a tendency by wine critics, including Italian ones, to look down on the wines produced in the mezzogiorno, or southern Italy. What is missing in this blanket evaluation of Abruzzo wines, is the fact that many better-regarded French and northern Italian wines contain in various measures wine from this region, since much of it's production is still shipped north for blending purposes. Despite the outward simplicity of Abruzzo's DOC system, certain details of Abruzzo's production are worth pointing out. The native Montepulciano (not to be confused with the town of that name in Tuscany where Vino Nobile is made) is a vine of convincing character that has been winning admirers abroad. In parts of Abruzzo, notably in the low hills of the northern province of Teramo (where it can be referred to as Colline Teramane), Montepulciano becomes a red of irresistible character, full-bodied, even robust, with a capacity to age but with such supple smoothness that it can be eminently drinkable even when young. In higher inland areas, or from vineyards where growers have the habit of high yields, the wines tend to be lighter, often better suited to Cerasuolo, a sturdy cherry-colored rosé. Most Trebbiano is based on the prolific Tuscan variety, which makes light, rather acidic whites of subtle aroma and flavor. A few growers work with the true Trebbiano d'Abruzzo (which may or may not be related to the Bombino Bianco of Apulia). A choice few have managed to make Trebbiano of remarkable depth and texture, with a propensity to develop complexity with four or five years, sometimes even more, of aging. But those fine wines are not easy to find.